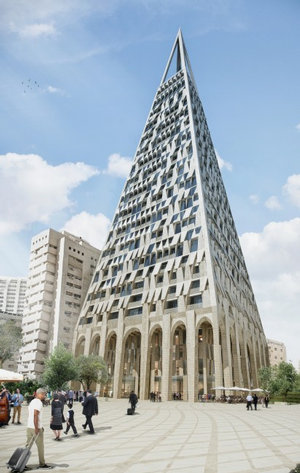 With a go-ahead from officials and ground broken for the site of a modern skyscraper in an ancient city, proponents and critics are at odds over both the shape and need of a “pyramid” in Jerusalem. City officials say The Pyramid—a 345-foot stone and glass tower that will include luxury apartments and commercial tenants—will help revitalize the area, according to Architectural Record. Vibrant Space, or Ghost Town? A 345-foot skyscraper known as The Pyramid is planned to be built next to an ancient open-air market. Jerusalem scholars are concerned the building will create more "ghost apartments." Kroyanker said he is concerned that the building, which will include both luxury apartments and affordable housing, will create more ghost apartments. Jerusalem has a high number of apartments that are owned by people who visit the country for just brief periods each year, the AR explains. The pilgrimages to Jerusalem are part of the traditions of people who practice Judaism, and the city sees an increase in visitors each year during three important Jewish holidays: Passover, Tabernacles and Pentecost. That’s one of the reasons Kroyanker is worried about building more housing in a city that has a lot of units empty for most of the year. His concerns were echoed by Ravit Hananel, a professor of urban planning at Tel Aviv University, who specializes in how housing policy affects society, AR said. Hananel and one of her students studied the concept of ghost apartments in Jerusalem and Tel Aviv. Although Studio Libeskind described the project as becoming “an integral part of the neighborhood,” Hananel said she is worried that the building will reduce further the urban diversity of modern Jerusalem, AR said. Meanwhile, the 1.7-acre plot that formerly housed the Eden Cinema has already been demolished to make room for what will be the second-tallest building in the Israeli city. Work has begun on the site that is near the Mahane Yehuda open-air market, but it will not be completed for several years, Architectural Digest has said. In addition to the apartments, AR reports that the building will have a boutique hotel, a restaurant and a first-floor mall of upscale shops. And while The Pyramid had been seen as an odd choice in a city that doesn’t have large ancient pyramids, architects recently discovered that the design might be fitting after all. According to the Daily Mail, a 2,000-year-old pyramid-shaped platform was recently uncovered in the City of David National Park, which is close to the walls of old Jerusalem. The podium was next to a street that was used by pilgrims as they made their journeys to the temple during the period known as the Second Temple. Reports indicate that the discovery and the project have no relation, and that archaeologists are still trying to determine how the pyramid platform may have been used.